So my Bellabox December review is totally going up after Christmas rather than before, but man, the holidays have seem to fly by so fast! Oh well, better late than never! I hope everyone had a great Christmas and are all ready for the new year! Anyway, I'm sure you're wondering how December's Bellabox was, well here we are! It's mostly skincare and haircare from lesser-known brands this time, so if you're into these types of products, then that's great. Perhaps I've been living under a rock or something, but only two of these brands are brands I've actually heard of before, and I've actually only reviewed products from one of them! 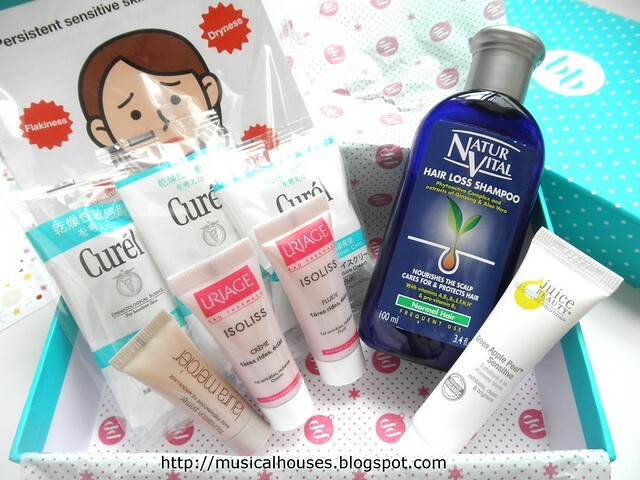 So this month's box is really all about exploring new, niche brands for me. Well, without further ado, let's get this review started! 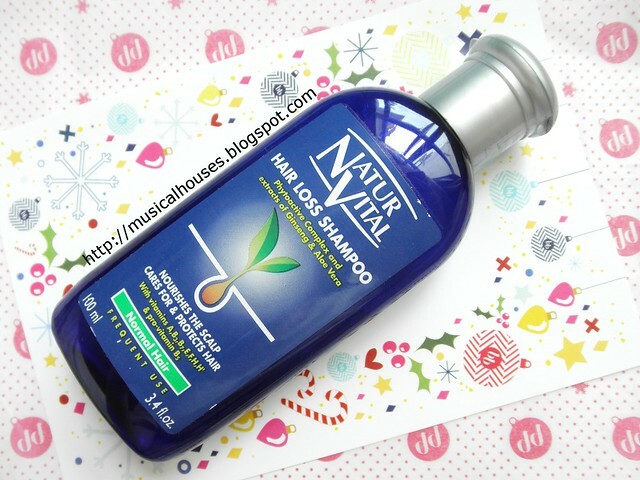 The first item is a Naturvital Hair Loss Shampoo. To be brutally honest, I highly doubt it's possible to combat hair loss just via a shampoo, especially when the product claims that the ingredients that do the work are plant extracts like ginseng and aloe vera, or vitamins, rather than actual drugs that have a stronger basis for hair loss claims, like minoxidil. But nevertheless, these products continue to be popular. I've never tried this before, and I imagine it would work perfectly fine as a shampoo, although I'm a bit more skeptical about the hair loss claims. 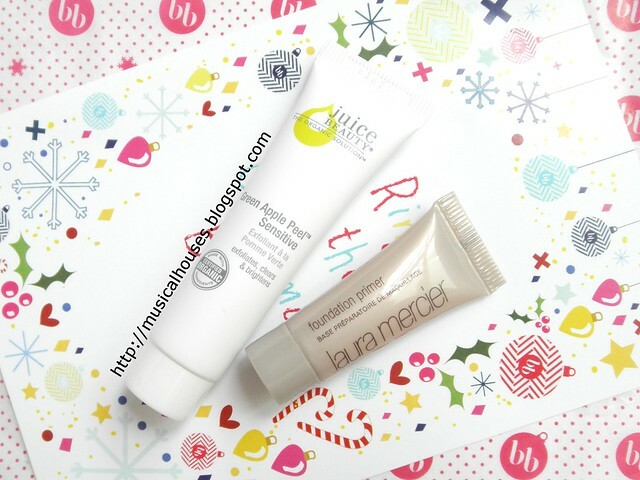 There's also a Laura Mercier Foundation Primer as well as a Juice Beauty Green Apple Peel. I've already reviewed the Laura Mercier Foundation Primer before on my blog (sort of), and found it to be pretty good, but the Juice Beauty product is new to me, so that is interesting. I've never tried the brand, but seem to recall having heard some raves about it, so this product looks pretty promising to me. 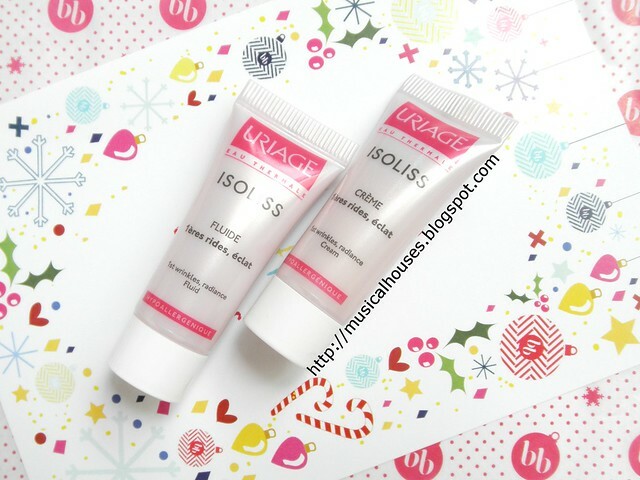 There's also two Uriage samples of their Isoliss Creme and Isoliss Fluide, which are anti-aging products. These are also supposed to help give your skin more radiance. Uriage is new to me, and surprisingly I don't actually recall having heard of this brand before! They seem to be in the same line as Vichy or Avene - European, somewhat clinical, and a little minimalist, without skimping on quality. I do like both Vichy and Avene, so I'm keen to try this out. 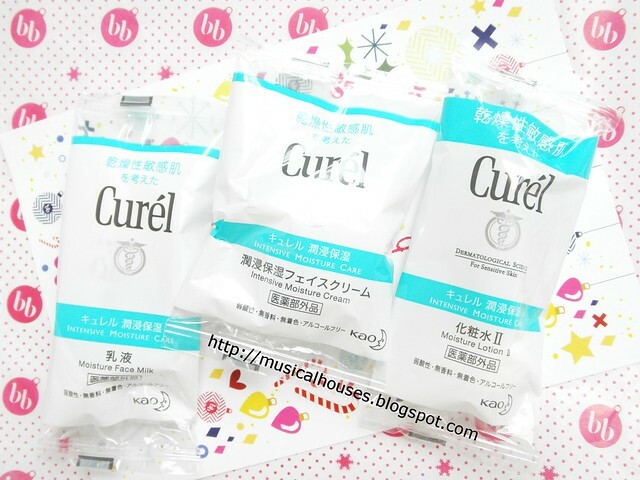 Lastly, we have some samples of Curel's Intensive Moisture Care products. There is the Moisture Lotion, Moisture Face Milk, and Intensive Moisture Cream. 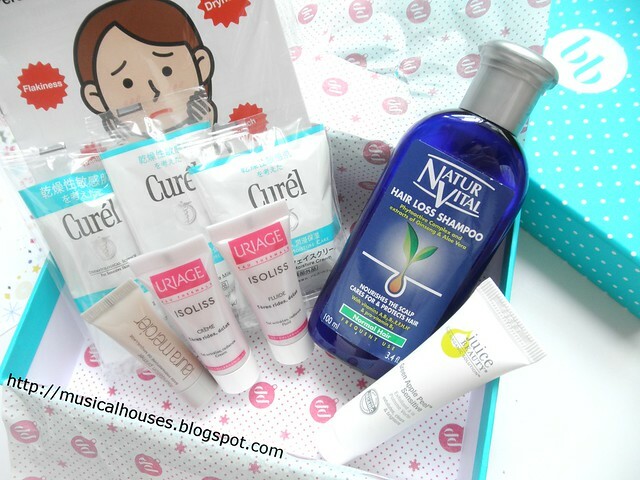 I do believe I have some Curel products sitting around that are overdue for review (oops! ), but I generally do think Curel has pretty good skincare, from my limited experience with the brand. How did I find this box? To be really honest, this box wasn't that exciting for me, because most of the samples were pretty mini-sized. The largest sample was the shampoo, which was alright if you like haircare, but for me, a makeup or some other type of skincare sample as the "jumbo-sized sample" might have been more exciting, just because of my product preferences. I've reviewed other Bellaboxes from previous months, and usually they're pretty alright, and sometimes I've even gotten great things, like a full-sized lipstick, or samples from an otherwise pricey-to-try brand like SKII, so this is probably the first time I've been underwhelmed by a Bellabox in the 2 years or so that I've been reviewing the boxes. Of course, with a subscription box, I'd expect there to be some variance in how much I like the box from month to month. Well, there's always next month's box to look forward to! So who do I think might like this? If you're not too bothered about the size of the samples, and like haircare and skincare, and like trying new brands (well all these brands except Laura Mercier and maybe Curel were new to me anyway!) for yourself, then this might be interesting to you, although personally it was not quite my cup of tea.